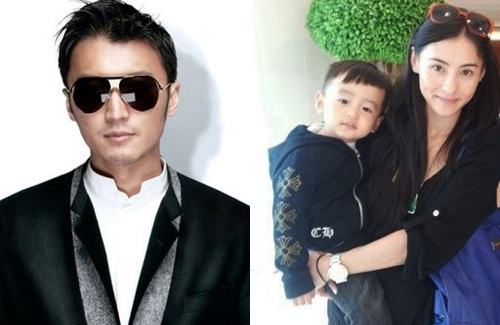 Nicholas Tse (謝霆鋒) and Cecilia Cheung (張栢芝) may have one of the most turbulent relationships in the industry, but the two were able to put all differences aside in order to give their younger son Quintus (謝振南) a happy fourth birthday. Currently filming in Singapore, Nicholas reportedly took time off from work on May 12 and spent it instead with the birthday boy. Although Cecilia had threatened to relocate her brood to Canada last year, she ultimately decided to make a new home in Singapore to Nicholas’s great relief. While the two have been unable to reignite their romance, they have surprisingly grown closer as friends and are happily sharing parental responsibilities. Settling in Singapore may have proved a blessing to their children, who are able to enjoy more regular visits from their father. Currently filming food and travel show Chef Nic <十二道鋒味> in the country, Nicholas was able to meet up with his two sons on Quintus’s birthday. Cecilia also spent quality time with her boys the day before on Mother’s Day. The three were spotted at a local shopping mall, and Lucas and Quintus attracted much attention while riding their scooters and playing adorably. While Cecilia frequently made it known that her children will always occupy the top spots in her heart, she recently revealed a shocking reason behind her fervent love. As a judge on reality competition program Super Diva <媽媽咪呀>, she halted a pregnant singer’s rigorous dance routine out of concern for her child. Cecilia then disclosed that she had suffered four miscarriages prior to successfully giving birth to Quintus, and asked the competitor to put the baby’s safety first. Many fans agreed with her decision to stop the performance and praised her for her strength. To celebrate Quintus’s birthday, a few creative fans put together a music video of Cecilia and her youngest. Others flooded her Weibo with well wishes and even prayed that she and Nicholas may one day reconcile. I did not know she had 4 miscarriages before Quintus. I just had a m/c and I thought 1 miscarriage was a lot already. Yup, 1 miscarriage is more than enough to bear for a normal person. But for Cecilia to MC to the world 4 miscarriages. She has a dirty mouth. The girl knows no shame. LOL! They have two beautiful children…cute kids..
Wow. While I applaud her courage and determination to not give up and ultimately produce a beautiful child that she will no doubt love,…. I also wonder why the feck did she not consider adoption. So sick of most Asians thinking that adoption is a dirty word. I get the whole “heritage, bloodline, tradition” thing, but wth? Pretty selfish of her to put their relationship in a rough spot, put her in more stress each time she miscarried, and also put Quintus in a stressful position while in the womb, and outside he is probably going to be smothered with a helicopter mom. I’m glad that he turned out healthy and looks like a bright happy kid, but the struggle to get there was, imo, not worth the risk, when there are so many orphaned kids needing a loving home.